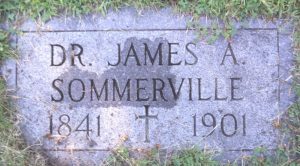 Dr. James A. Sommerville was born in Kingston, Ontario in February of 1841. He was the 3rd of 7 children born to Alexander Sommerville and the former Jane Douglas. His father was an engineer and his siblings were; Jane, William, Sarah, Henry, Joseph and George. In 1861, Dr. Sommerville was teaching school in Kingston, prior to attending medical school. According to the 1882 Ontario Medical Register, Dr. Sommerville graduated M.D. from Queen’s University in 1866. According to the 1871 census, he was living in Warwick, Lambton County and working as a physician. Dr. Sommerville married Maria Louise Cook on the 16th of July, 1862 in Strathroy, Ontario. She was the eldest of 7 children born to Timothy and Harriett Cook. Her father owned the local mill and her siblings were; Susan, Gertrude, Mary, Amelia, William and Hannah. A daughter Gertrude was born to Dr. and Mrs. Sommerville in October of 1875 in Watford (Lambton County). The Sommerville family was living in Mooretown when a son was born to them on the 4th of September, 1877. The baby was stillborn. In the 1880 Kent County Directory, Dr. Sommerville was listed as having a medical office and residence on Nelson Street in Wallaceburg, Ontario. The family moved to Marinette, Wisconsin around 1890. Mrs. Sommerville died on the 1st of June, 1894. She was buried at the Forest Home Cemetery in Marinette, Wisconsin. Dr. Sommerville advertised his medical practice in the Menominee Michigan Business Directory under Marinette, Wisconsin. In the advertisement, it identifies Dr. Sommerville’s business and residence at 630 Marinette Ave, Marinette, Wisconsin. According to the 1900 U.S. Census, Dr. Sommerville was living with his daughter Gertrude. Dr. Sommerville’s daughter Gertrude, married James H. McGillan on the 26th of April, 1901. Incidentally, Dr. Sommerville died the same day. He was buried next to his wife at Forest Home Cemetery in Marinette, Wisconsin. *His son-in-law, James H. McGillan was a respected lawyer and the Mayor of Green Bay Wisconsin from 1927-1929. Mr. and Mrs. McGillan had no children.